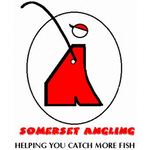 With nothing on this week, a few of us decided to have a little knock up on the lower end of the river, as per usual I was running late and by the time I got to Isle Brewers the draw had been done and Rob told me I was on peg 126a, not my favourite peg but it’s usually worth a few fish. Harry was below me on Barney’s Bend with Rob on 128 and Ash on 128a, above the bridge, Karl was on 124 and Steve was in the fence swim (123) and having a bit of a moan and I have to say it’s not a peg I like very much either. Despite the river being low and clear, it looked good and there were quite a few small fish topping, I set up a 0.6 gram DH16 with 0.12mm bottom and size 18 B611 hook and plumbing up, I actually had a fairly good depth through the middle of the peg. I was just about ready for the 10:30 start and shouted down to let Harry know we were off. 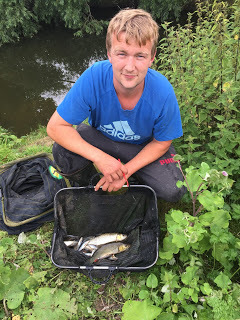 First put in I had a gudgeon and started getting regular bites from more gobies, small chublets and a couple of better roach, Harry was fishing the stick float and I could see he was catching regularly as well. After an hour I had around twenty fish and unusually I hadn’t had a minnow yet! Bites were starting to slow up and shouting down to Harry he said the same. To my right there were a load of stick ups with a little shallow run on the near side and odd fish were topping there so I held the rig back there and a positive bite saw me catch a cracking dace, next put in I bumped a decent fish and then had a nice roach and there were obviously a few fish there. I added two more decent fish but also bumped a couple and I knew I was well over depth so decided to try and fish there properly and plumbed up again. It was about a foot shallower so I adjusted the rig and I really thought I’d catch well but apart from a few smaller fish it was a bit of an anti-climax! 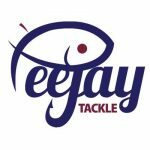 I then tried fishing close to the stick ups and had a few small chublets before I hooked what felt like a better fish only for it to reach the sanctuary of the reeds and it snagged me up, thankfully I got the rig back intact. Then I had a nice surprise in the shape of Paul Homewood who came for a look round, he’s recovering from a recent operation and was looking well, so hopefully we’ll see him back on the bank soon. 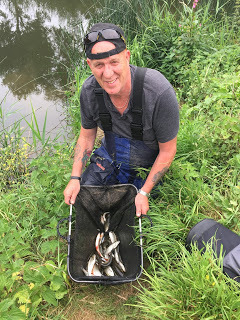 We had a nice chat and he stayed until it started raining and left me to it, he reported that Ash was catching the odd small fish and that Rob had caught a chub around the pound mark along with some gudgeon but it didn’t sound like anyone was bagging. Harry shouted he’d caught a fish but wasn’t sure what it was, he came up and showed me, it was a big ruffe that had to be 2-3oz! Bites were now hard to come by with just the odd obliging gudgeon and chublet. Ash came to see how we were getting on and he was admitting to about a pound and a half, I said I thought I had around 3lb and that I reckoned 5-6lb would be a good weight today. There were still odd fish topping in the shallows above me so I moved the rig down to about 18 inches and added another section, first chuck I had a 4oz chublet but any thoughts of bagging up soon disappeared and I only added another couple of small chublets before it was back to scratching my head. Harry had a couple of 12oz chub on breadflake on the tip and lost one as well and I didn’t think there was much between us. For the last three quarters of an hour I upped the feed and held the rig back in the deeper water in front of me and added another four chublets for 10oz or so. 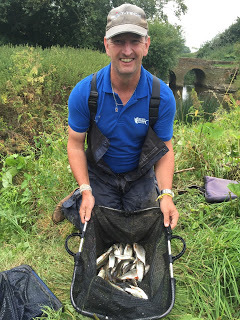 My final tally was 54 roach, dace, chublets and gudgeon (plus a solitary minnow) and I hoped I had 5lb or so. I packed up and just as I’d put it in the car, Rob arrived and said he’d struggled and not had a bite for the last two and a half hours! 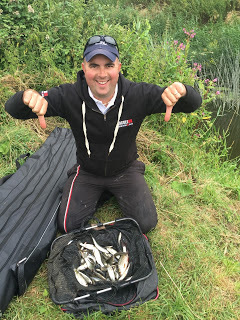 Ash was first to be weighed and he had 2lb 9oz of small fish which is about par for the peg and I hope I don’t ever draw it, then we got to Rob and he had 5lb 2oz and I started to think this could be tight. 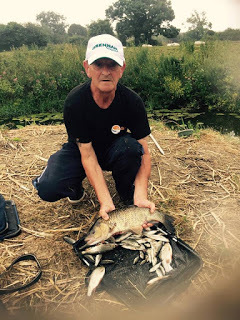 Harry had 2lb 15oz and I thought he’d had more but he had a lot of gudgeon and they just don’t weigh anything, then it was my turn and I was disappointed to only weigh 4lb 4oz. I was hoping I might hang on to second spot but as we hadn’t heard from Steve all day, there was a good chance he’d had a few. Just as I chucked my fish back, he arrived and said he’d had a decent chub (and lost two) plus around 80 small fish and was admitting to 7-8lb.